Are you an unwitting testimonial in a social ad? You might be. Google is just the latest to roll out “shared endorsements”, which post users of Google+ and Gmail as endorsers of products they have shared using Google+. These online testimonials will be shared beginning November 11 on Google products such as Google Maps, Gmail or Google search. Facebook is already doing it, so what’s the big deal? Sounds like great marketing? It seems that advertisers and social media are the only ones profiting from this relationship. It may be the price we pay to have free use of social media. But here is the rub. The endorsements are trusted by consumers, yet may not be a true expression of the endorser. Some 68% of people trust word-of-mouth recommendations or “earned advertising” from other consumers, according to a 2013 global survey by market research firm Nielsen, up from 61% in 2007. Consumers also put less trust in ads appearing in newspapers (61%), magazines (60%), television (62%) and radio (57%). After seeing a friend “like” a product on social media, 29% of U.S. Internet users check out the product, 14% visit the product’s website, 11% visit the product’s social media page and 5% “like” the product, according to research from Adobe Systems. Many of us have “liked” a page, only to enter a contest, or get a discount, or to create a wish list on Amazon or eBay. That encounter does not always mean we have a relationship with the company. 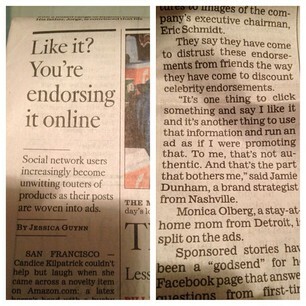 As I expressed in the recent LA Times article, the ads are not an authentic representation of the consumer. The “free love” period of social media is over. Doesn’t seem too free anymore, does it? As marketers, I think it is important for us to be aware of the full story for endorser ads, and to advise our clients appropriately. You are currently reading Marketing to Women: Endorser Ads Starring “You” at The Lipstick Economy.